Due to the recent Ebola outbreak in West Africa, many American citizens and politicians have debated sending aid to countries in Africa help out. Recently, President Barack Obama gave the thumbs up to send military reservists to help fight the Ebola outbreak. Currently there are 540 US troops stationed in Liberia, a number that could increase to 4,000 troops in western Africa in the near future. According to Center for Disease Control, Ebola is “a rare and deadly disease caused by infection with one of the Ebola virus strains.” The disease was first spotted on March 25 in Guinea, but went unnoticed for some time. 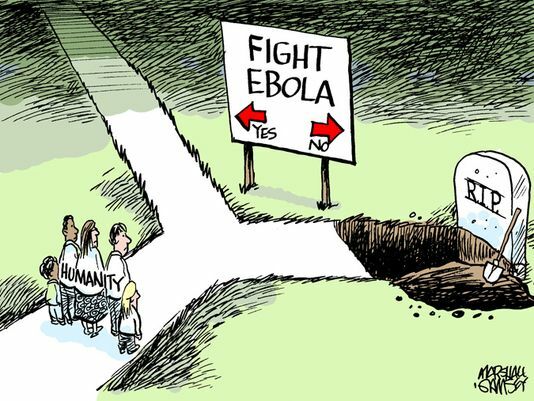 Soon after, 100 people had died of the same symptoms, leading to the conclusion that the Ebola virus had reappeared. Doctors worked diligently to prevent the spread, but it was inevitable. Although the disease is not transmitted through air, it is contracted through contact with bodily fluids. African people were dying, left and right, without a known cure. Initially, the international community expected (or hoped) the disease would be contained to western Africa and die out, but with infected patients diagnosed in U.S. and other first-world countries, Ebola has clearly become a global problem. By choosing to send medical aid to affected countries in Africa, American lawmakers made an intelligent choice. If America has the supplies and trained personnel that are not needed at home, then why not send them to those who so desperately need it? Each day, Africans are dying because they do not have the correct medical supplies, which the United States can provide to them. As of Oct. 19, the World Health Organization announced that at least 4,877 people have died and there are at least 9,936 possible cases. It is predicted that if gone untreated, by the end of 2014, 220,000 new Ebola cases will emerge. Leaving Africans to solve this epidemic on their own will undoubtedly make this prediction a reality. By not turning our backs on people who are dying, we will be able to solve the stop Ebola from spreading and prevent more cases from arriving in the United States. This issue simply falls back on the saying, “Treat others the way you want to be treated.” How can we turn our backs on those who are in need of our help? How can we simply watch them die when we have the supplies and means to save them? Obama said, “Men and women and children are just sitting, waiting to die right now.” It is our moral obligation to help fellow humans when we have the ability and resources; to refuse or condemn aid is immoral and certainly unchristian.